As usual the past 3 months have gone by so fast at 10CO that it is hard to keep up. 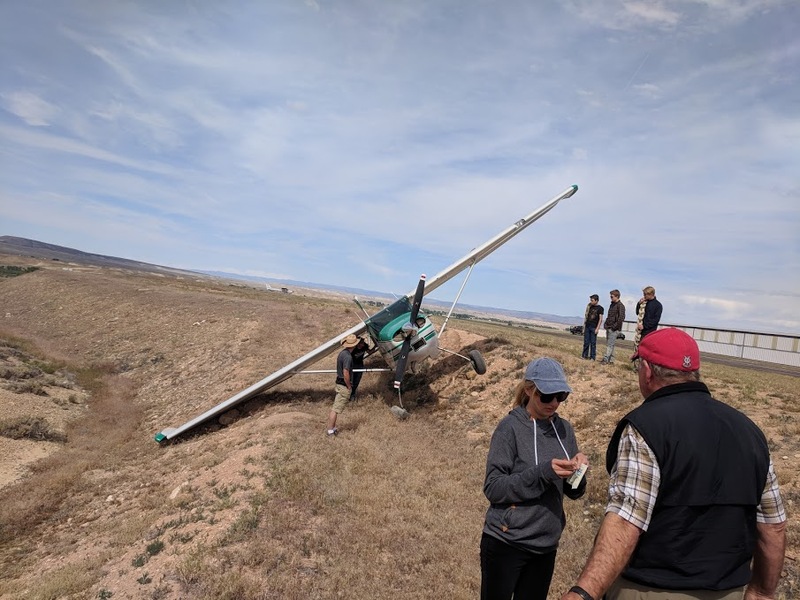 There is so much happening with EAA Chapter 800 and HAWK that I have not had time to sit down and even get the newsletter out. In this time frame there has been the Fat Tire Jamboree at 10CO. EAA 800 and HAWK worked together on to provide help, meals, t-shirts and other support so that the event went smoothly. EAA 800 supplied the food and the meals and Ken and Jeri Hurt plus Kim deserve a big big thank you. The meals were excellent and nobody went hungry. (Although more people attended than planned.) The weather was perfect for the Jamboree and the Jamboree came off without a hitch. 50 some airplanes and over a hundred and twenty-five people ate at the event. Both EAA 800 and HAWK managed to get sufficient funds to help pay for the campground fees for Kids to Oshkosh for both organizations. The fat tire Jamboree was a huge success. Travis Reese and his wife did an excellent job with promotion and logistics. Thank you both! And thanks for including EAA 800 and HAWK in the planning. Greg Lucas donated the Poker run winnings to HAWK $320.00 – that was a pleasant surprise- Thanks Greg!. Travis Reese donated $300.00, Tyler McClymond donated $400.00, Rick at Sun Country Cubs donated $500.00. And thanks to everyone who donated to EAA 800 and HAWK to support the programs. Both EAA Chapter 800 and HAWK paid for the band and the food out of what was donated but the donations exceeded the expenses. Life was good for all who worked the Jamboree. HAWK owes a very big thank you to Beth Stanton for her excellent article in the April Sport Aviation about the EAA chapter 800 and HAWK program. Beth Stanton, the author of the April Sport Aviation article, attended the Jamboree and was amazed at the goings on at MACK. Beth felt like royalty, as she got an hour of instruction in the HAWK balloon, she was introduced to the flying fun of Randy Miller’s 450 Stearman, flights in Carbon Cubs and to cap her trip, about 45 minutes of time in Rlee and JF’s A350B2 Eurocopter. Bet she is still grinning. If you see Beth at Oshkosh, say Hi from EAA 800 and HAWK. Beth had a really good weekend camping at MACK. Her article has really generated donations in both cash and goods to help keep the programs viable. Some of the donations include $2000.00 from Micheal Jager, Mark Guenin donated $1000,00. 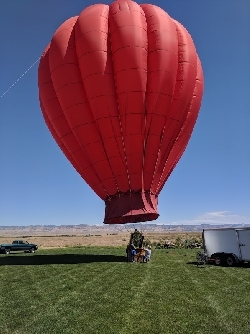 Erwin Oertli, and Brian Kelly of Balloons West donated a used AX8B balloon system with 4.9 basket, burners and tanks, Josh Stanley donated an AX8B envelope with 4.9A1 basket plus an 8HP Fan for HAWK to repair and sell. Gary Owens donated numerous rivet guns, angle air drill, straight air drill, bucking bars, Cleco’s and P&W 985 tools. Brian Miller had a really good pneumatic Rivet puller donated by a guy named Tom out of Dillon Colorado. HAWK mentor Tim Allen, HAWK’s certified ground instructor Michelle, HAWK president Brian Miller and three HAWK kids Caiden, Ryan and Jake made a road trip to Salt Lake City and picked up Will and Karen Jefferies’ Hot Air Balloon, tether harness, night lights, radios, inflation fan, 6 tanks, and other stuff they donated to HAWK. The kids set up the balloon the end of June. Braden inflated the balloon with HAWK kids help. The Galaxy AX7 N5244J is in exceptional shape. The balloon is solid red and the kids are calling it the Tomato. The balloon sat for years and does not have a lot of time on it. Will can no longer fly due to new knees and other parts. It will make a good backup for N90555, the balloon HAWK kids are currently flying. THANKS WILL AND KAREN. The balloon will teach lots of kids. In addition, I am going to fly out to Oshkosh in the Mooney and stop to look at a 2 thirds scale Fieseler Storch Fi 156 a nice gentleman wants to donate to HAWK and possibly we will pick up on the way back from Oshkosh as Russel Franke is towing a transport trailer to Oshkosh. Mike Duggan of Longmont EAA 648 and Tom Aguirre donated his flight bag and headphones to the program. Every week something new shows up. BETH YOU DUN GOOD! (As a side note – HAWK only works on donations and currently pays for 3 hangers, the expenses do not stop. Hopefully with the sale of airplanes HAWK can do more to make aviation affordable for the kids. No mentors are compensated for their time, in fact most mentors contribute funds to keep the kids flying and building). A very big thank you to West Star Aviation. West Star donated $2000.00 to EAA 800 and HAWK to help pay for fuel and meals for the kids. Thanks Mr. Krogman West Star president. West Star’s very generous donation helps make the trip happen. They have been our primary Oshkosh trip sponsor the past 3 years. They donated the awesome paint job on the Cherokee. Hightower Supply donated the Jet Glow paint which is the best and very expensive- Thanks Pat Trimm. Saturdays in the HAWK hanger have been very busy. HAWK kids are making the necessary preparations for the trip to Oshkosh. HAWK was attempting to have their Zenith 701 flight ready for Oshkosh and up until the end of March thought it possible. The problems due to the Pega Daedalus wings have really slowed that project. Because of donations, and the funds from the jamboree meals, EAA Chapter 800 was able pay for the two campsites at Oshkosh for the kids. Preparing for the trip to Oshkosh has been interesting. The kids going have constantly changed and HAWK mentors have had so many problems that their schedules have also been constantly changing. This year scheduling has been worse than previous years. I would equate it to herding cats. 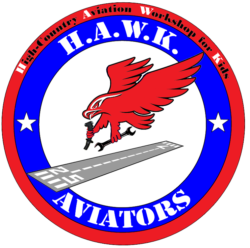 HAWK and EAA 800 are taking seven kids to the Oshkosh show. The seven kids are the ones who are always working in the shop each Saturday. This years Oshkosh trip should be really interesting. Braden Hobbs, HAWK’s new 17 year old pilot, is planning on flying the Cherokee N9606W to Oshkosh (with Mom and Dad’s approval). 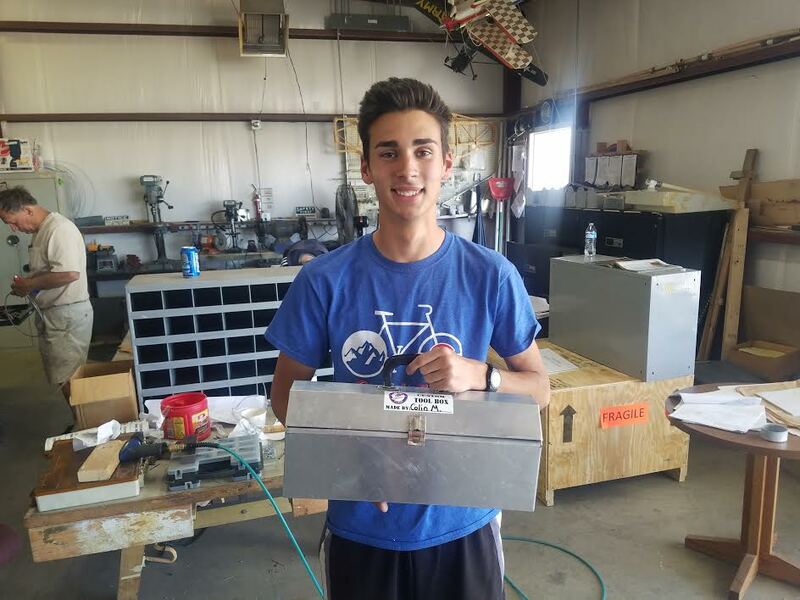 Braden is working on his instrument and commercial fixed wing ratings and his private balloon rating. He is rapidly building hours. 2014 Arion Lightening donated by Ron Huddleston. 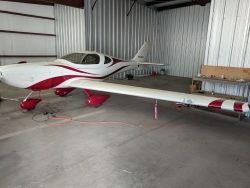 This plane is for sale to fund the program. Sterling is planning on flying the donated Huddelston Arion Lightening N732RN to the show with plans of selling it to support the HAWK program. Anyone wanting a real nice light sport, this is the one. Shay and Logan are again flying their 172 to the show. Logan has soloed and is building time. The plan is similar to the past years. The ground caravan will rendezvous with the airplanes at Aurora Nebraska on Friday night and continue to Oshkosh Saturday the 21st. Hopefully the weather will cooperate. No problem for the ground crew, big problem for the 3 air crews. N838CP the HAWK 701 has proven to be a handful. HAWK wanted to fly it to the show but issues keep showing up. Pat Wheling, one of HAWK ‘s mentors, and Tim Allen, another Mentor, have taken on the project with the kids. The Canadian Pega company, that made the wings, is no longer in business. HAWK has their build data but it is severely lacking. The center of lift is different than the standard wings. And the center of lift has presented a whole set of problems with the weight and balance. Pat and Tim are closing in. Hal Stockman (Zipper Big Bore) examined the airplane and engine and gave us some good ideas. He also had a spare Luga ground adjustable carbon fiber prop he fixed us up with. The prop is extremely light. I have never heard of a Luga prop. Apparently it is Russian. Hal is the guy who rebuilt the HAWK 912UL’s drive. Hal is a Rotax expert. Hal will be flying his new Rans S-7 with his special Rotax engine that turns out 130HP in the Oshkosh STOL show. You can always identify Hal as he wears coveralls with a reflective strip on them everywhere he goes. If you see him, say Hi. Last year Hal flew lots of Young Eagles at Oshkosh. N838CP hopefully will make the show next year. Russel Franke donated Luscombe 8A? Russel Franke got in trouble with his HOA at his home because he has to many airplanes in his yard (One can never have too many airplanes). Russel’s new lawyer neighbor who built a huge house directly across the street from Russel’s is really hassling Russell. Just like people who buy a house under an airport approach and then gripe about the airplanes. (The house now blocks Russel’s view. Russel did not contest it). Anyway Russell gave HAWK a Luscombe 8A he had in the yard to appease the neighbor. Hope it works for Russel’s sake, but doubt it. Anyway. the Luscombe Data plate says its an 8A but in reality it is an 8E as it has wing tanks and “D” window’s. The Log books show it as an ‘8A special’ The Luscombe society says Luscombe made some 8A’s that were similar to 8E’s. They had all the 8E modes but still had a continental 65 in them. On this airplane someone was modifying the firewall with the pan to accept electrical. The workmanship is not good and a new firewall has not been located to date. Russell also gave HAWK an 0-200 off a Cessna 150. The airplane and engine have full logs but the registration expired and the N-number is now on a Cessna 205. The project will be shelved for a while until parts are found. The air frame is in really good shape and should polish out. Thanks Russel! N13245. the 172 Russel Franke gave HAWK is progressing nicely. Solomon, Krista and Jaden have the hail damaged wing skins drilled off. And Krista and Braden are riveting the new flap skin on and are about finished. Krista has all the new skins fit for the elevators and trim tab and is working on reassembly. Again Hightower Supply came through and supplied the Sherman Williams epoxy primer for the project. The 172 will be totally primed inside all the areas where the skins are removed and replaced. Krista and Braden are doing an awesome job of riveting the skins back on the flap. N9606W is being cleaned, serviced and polished for the Oshkosh trip. N90555 the HAWK balloon now has the fancy Firefly donated 4.0 basket officially installed with the extra Fuel tanks HAWK acquired with the donated systems. Watch for the HAWK balloon N90555 at Oshkosh. It is signed up for the Monday tether and the last Saturday free fly. EAA Chapter 800 president Kim Neibauer is towing it out. The winds have not been kind at 10CO so the HAWK balloon has not been flown much. Fall is coming – it has been a very hot windy spring as evidenced by all the Colorado and Utah wildfires. 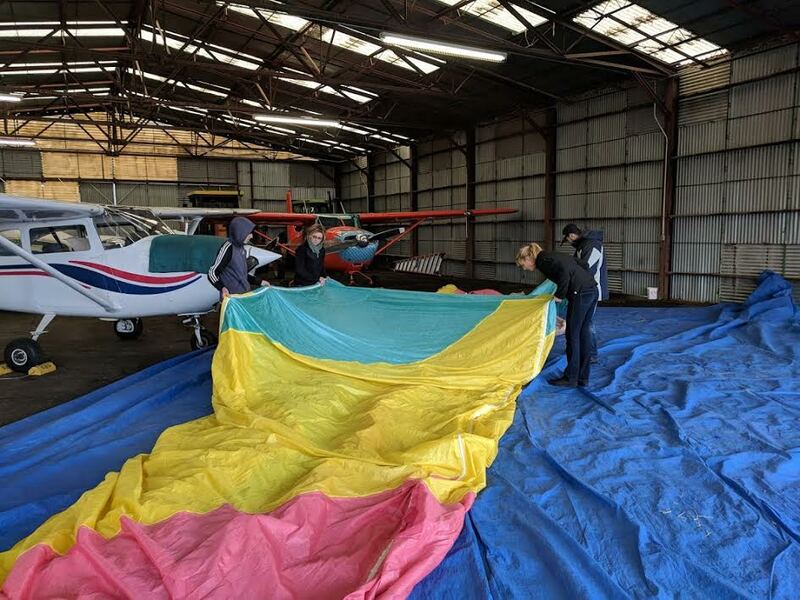 The HAWK kids are working on HAWK- EAA 800 banners for the balloon- hopefully they will be done, but like everything, time is flying by. OSHKOSH IS COMING! As a side note, The Sport Aviation Article has generated a lot of interest by other EAA Chapters and interested individuals as to how EAA Chapter 800 and HAWK set up the program. Oshkosh will be interesting in that I am going to take paperwork and other items to share with other chapters who want to talk about the program. So far the HAWK program has been a resounding success and others want to copy it. All of the HAWK mentors are more than happy to share any info with other EAA chapters about how to set up similar programs. HAWK started with nothing but an idea of doing something beyond Young Eagles. And HAWK has turned the idea into a real functioning program and kids are becoming pilots that would not have had a hope before. This is evidenced by kids flying airplanes into Oshkosh. It has not been done without trials and tribulations but so far the program is working better than anyone believed. Any EAA Chapter can do the same thing. 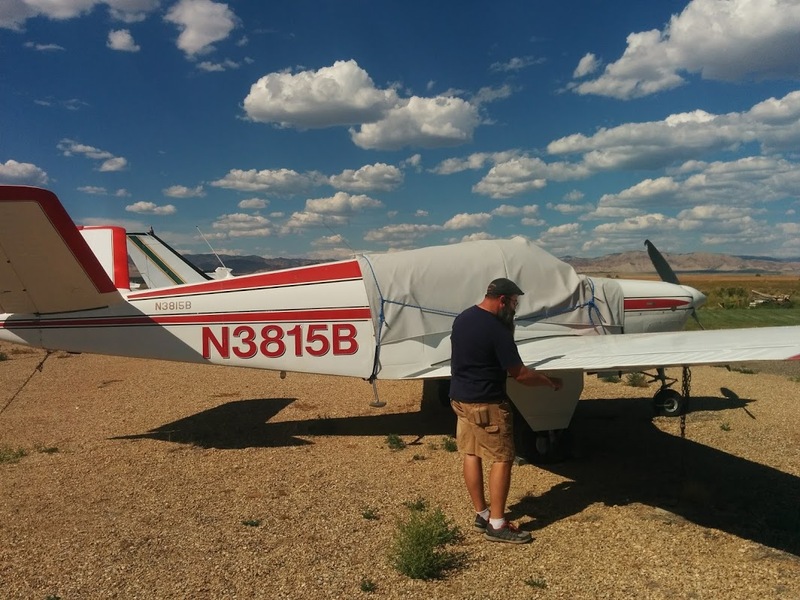 It is really nice to see a dying EAA Chapter become a active viable program. EAA Chapter 800 now has a good turnout each chapter meeting of kids younger than 80, and now has aviation excitement again. Again I want to say THANKS to all the HAWK MENTORS who make the program work! [Eddie:] Here is the report of my part of the weekend. The 180 in the ditch. Krista and the HAWK kids studying the problem. Larry is the guy in the background. Really a gentleman- Hope his fishing is better than his taxiing. I told him it was his decision what he does as it is his airplane. Both Larry and I were pleased with the repair- you could not tell it was damaged when it was done. I could not believe he did not get the prop He just put a new engine in the airplane. It just had 40 hours on it. This is proof Cessnas are rugged. 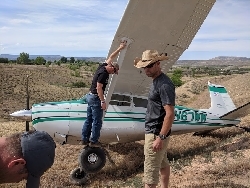 The 2nd thing – Larry Martin was taxi-ing his Cessna 180 N67WW and ran into the famous airplane eating hole- Troy Ball found it last year. (Ladd had just removed the cones and was taking Beth to the airport). OOP’s. Anyway, The HAWK kids got the HAWK balloon tether ropes and with Bobby Boes and spectators help get his airplane out of the hole in one piece. The wing tip was a little customized by crunch but otherwise the airplane was OK considering. Hector Larry’s Mechanic had returned home to Glenwood springs and did not have time to look at the damage. I being the nice guy I am plus Braden (Nice guy he is) Larry, Jake (Another nice kid), Michelle (the nice fiberglass go getter girl ) and Brian (Questionable 🙂 took the project on and straightened the bent parts. The wing looked as good as new when we were done. Larry was so happy he tried to pay me but I told him to give HAWK the money. At Hectors shop rate it came out to about $600.00. Brian, HAWK’s president was more than happy to take the check. Heck I did not even get to see it. So final total with the gambling money was $950.00 to HAWK. not bad for a week ends work. Larry continued his fishing trip. On an important HAWK thing- Steve Brown and Lexi are so impressed with HAWK they want us to take over the Hay hanger to expand. They will insulate it and heat it. Ladd said the rate would be $2000,00 a month. The good part is we would have everything in one place. (Give me more room to pile free stuff). The cost scares me- I told Steve it is up to the HAWK VIP’s (Board) not my decision. HAWK needs a board meeting sometime in the future. I talked to Hal Stockman about the 701. He said the same thing Darrel at WARP Drive said on the prop we have. It is too Long for our engine. Hal has a Luga Prop that is the correct one made in the Ukraine. (He runs them on his airplane) They are the same price, about $690.00, for a complete ground adjustable prop as Warp Drive charges that just for the 3 blades. Hal said he has one in stock. He offered to pay the freight. Hal said we should be able to get at least $200.00 for HAWK’s warp drive Rotex hub on BarnStormers. That would make the 701 prop very inexpensive. Hal was a wealth of knowledge. Another great guy. Steve Wood looked at the new Luscomb 8 HAWK now has. The data plate shows it as an 8A. The airworthiness paperwork, with the same serial number, says it is an 8E One log calls it an 8A special and the other one says 8E. Steve says it is an 8E, as it has two wing tanks and rear windows plus all the E upgrades. In the paperwork it is called out as an 8A special. He has never heard of a special. He is interested enough, he is checking it out. He has agreed to help us with whatever we need for it. He is excited about it. Says it will be a nice airplane for the kids. He was upset the N number is gone -Russell let the registration expire and the number is now on a Cessna 205. Beth had an awesome time- She is taking what she experienced to her editor – He makes the decisions about what goes in Sport Aviation – We shall see- Maybe MACK and HAWK can take over Sport Aviation (HA HA). I can tell you she was impressed. She said her HAWK article was accurate but there is more going on than she even dreamed. Everyone made a good impression on her. THANKS everyone- good show. AND THANKS BETH FOR ALL YOU HAVE DONE FOR HAWK! Thanks to the kitchen crew both EAA and HAWK- well done! HAWK and EAA chapter 800 are separate organizations that work hand in hand to get and keep the kids interested in aviation careers. This newsletter was delayed because of numerous exciting things happening with both organizations that carried over in to March. I will start with the March happenings then back up to January. He passed his check ride with flying colors. Braden is HAWK’s first official in-house trained pilot. There will be more pilots shortly. Sterling H-HAWK’s CFII was invited to attend the AOPA Bob Hoover awards ceremony in Washington DC. Sterling was fortunate enough to sit at the table with Mr Vangrunsven and his wife. (yes the VAN’s aircraft owner that has over 10,000 airplanes flying and another 4000 plus in construction). Sterling had a really good time and really represented HAWK. Sterling was fortunate enough to rub elbows with all the VIP’s in aviation- lucky guy!. JF and Rlee loading kids for helicopter flights. J F and his wife Rlee brought their personal Eurocopter AS350B2 helicopter to the EAA Chapter 800 March monthly meeting at MACK and flew 15 of the HAWK and EAA 800 kids and also flew 5 HAWK mentors. 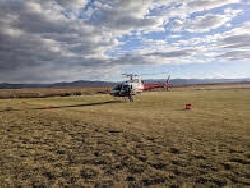 A Eurocopter AS350B2 is not inexpensive to operate, it was a real treat for the kids. J F flew 5 kids at a time for about 15 minutes and the ones lucky enough to get the co-pilot’s seat actually got to fly the helicopter. Braden, Krista, Kaitlin, Shay (a HAWK mentor) all got helicopter control experience. HAWK could really use a Donated Helicopter as the kids are hooked. If anyone happens to have one just sitting around? Programs like bringing a Helicopter to an EAA meeting really helps keep the kids interested. Jake M(15) talked about his hot air balloon instruction at the meeting and how excited he is to be able to start feeling like he can fly it. He is getting good and should be able to get his Private pilot’s license this summer when he turns 16. He is getting close to doing his solo flights and has his Student Pilot’s license. A little more instruction and he will be ready to solo – he just needs to get his written test out of the way. One big problem in Ballooning is the lack of Designated Examiners. 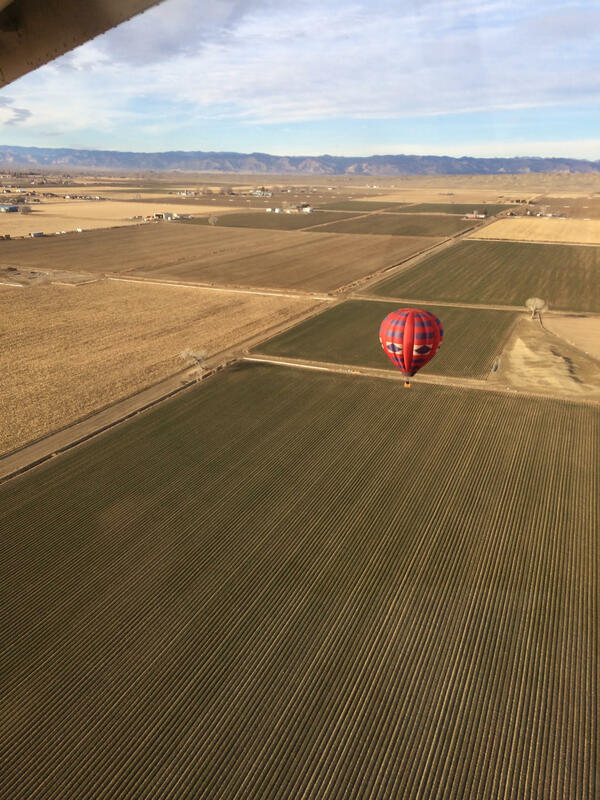 There are not any balloon Designated Examiners in Colorado and the only ones are in most of the west Utah and New Mexico. It seems that there is getting to be a lack of Designated Examiners in all phases of General Aviation. The EAA chapter meeting also dealt with figuring out how the EAA Chapter 800 and HAWK trip to Oshkosh will be handled; what kids are going and who will be mentors to oversee the kids. Another discussion concern’s the funding and logistics for the trip. This will be the third trip for the organizations. The kids are lining up to go and are really excited. 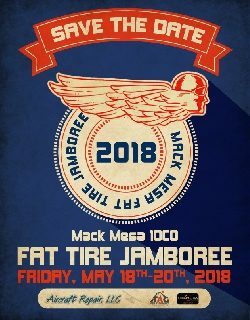 The next topic was the MAY 18-20, 2018 Mack Fat Tire Jamboree. EAA Chapter 800 with HAWK’s help is feeding the attendees and their solicited help at the chapter meeting. Anyone wanting to help please contact EAA 800 president Kim Neibauer or Ken and Jerry Hurt. The Jamboree is always interesting. Mack has free camping and airplane parking areas on a nice manicured grass area. Plus there is an evening bonfire and other goings on during the event. Bring your airplane and come play or if you do not have an airplane still come enjoy the festivities. (I would bet J F could easily win the short takeoff and landing competition). As mentioned above Braden’s work has paid off he is now an official pilot! He is HAWK’s first in-house trained pilot. 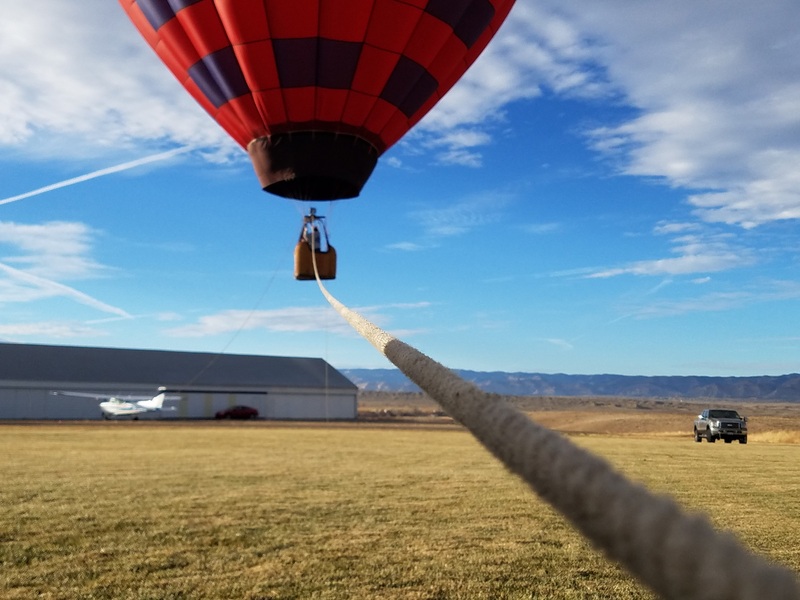 He is starting his next rating – his instrument rating plus his Hot Air Balloon rating. (Braden turned 17 in January). Logan has now soloed in the family 172 and is working on his hours for his Private. He turns 17 in August and should be ready for his Private about the same time. Jake and Christa should have their Hot Air Balloon private’s before years end. The Cherokee flies instruction regularly. 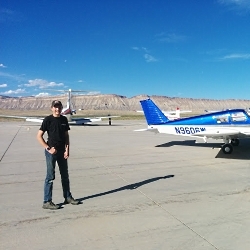 Braden took his checkride with Lynn French the Designated Examiner. He chose to give him the test in the HAWK Cherokee. So far, Braden seems to finally be in harmony with the weather gods. Braden plans and the weather turns on him. 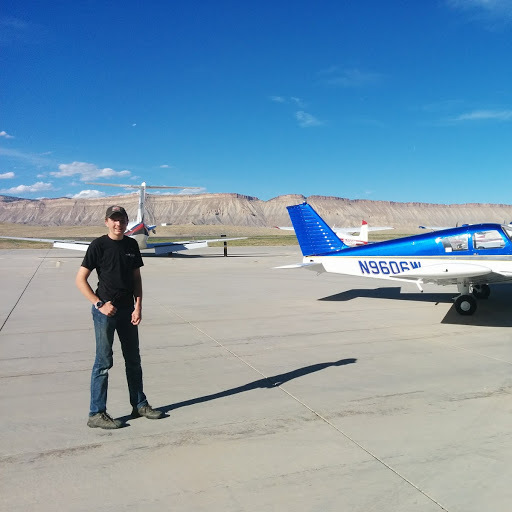 Lynn French issued Braden one of the last paper student pilot certificates before the IACRA program went into effect. 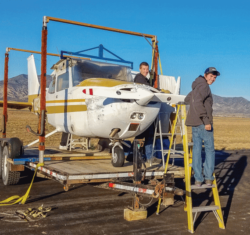 So far, thanks to generous donations of cash, airplanes and other items the HAWK kids can afford to fly the Cherokee for nearly free as long as they work in the shop and earn their time. Five hours in the shop gets them one hour plus $10.00 for insurance for flight time in the Cherokee. Braden is the caretaker of the Cherokee and rounds up the younger HAWK kids to clean it, keep it nice and shiney and now he can fly them. Sterling is the mentor and instructor in the Cherokee. Jerry F is the AP/AI that keeps the maintenance current. HAWK’s January and February consisted of working on the Zenith 701. The 701 was moved into the heated build hanger and the wings are temporarily installed. The engine mount and engine are installed and now all the logistics of where to mount oil coolers and the new Zenith factory radiator is in process. The airplane was weighed (583 pounds) as it sits nearly complete- only the cowl and a few small parts were missing. It looks like it will be around 625 pounds when completed. It should really perform as light as it is. The Pega Daedalus wings make putting the airplane together interesting- they are totally different than the Zenair wings- longer with a different airfoil and with slide out slats. Pat and the 701 kids are doing a very nice job on the airplane. Tim Allen and his daughter Kaitlin made Carbon Fiber wing root fairings to fair the wings into the fuselage. They look awesome! Tim plans on making a Carbon Fiber cowl to help keep the weight down. Hal Stockman with Zipper Big Bore donated his time to check out the 912 Rotex going into the airplane. Hal purchased the pusher Rotex 912 exhaust that did not fit on the 701. Zenith is making the correct exhaust for the 701. The Zenith 701 is turning into a really nice airplane. Hopefully the 701 it will make Oshkosh 2018- that is the goal. 90 percent done 90 percent left to go. The crew working on the 701 primarily consists of Kaitlin, William M, William A, Collin, and Jake, with mentor’s Pat W and Tim A overseeing the project. The F35 bonanza donated by the Lovelace’s was evaluated after the donation became official in January. The airplane looked good and the leather interior was really nice. Once we got past the pretty there were numerous issues that needed fixed due to years of sitting, potentially costing a lot of money. 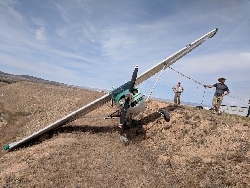 (Airplanes do not do well with non use especially if left outside to the elements – they are made to be used). The radios were old and out of date. The big item was the propeller. It had a big AD on it and after chatting with propeller shops it was determined that the HAWK piggy bank was not near big enough to handle the estimated cost to just do the AD, much less do the rest of the needed repairs. To comply with the propeller AD alone the cost could be from minimum of $4,000 just to comply if everything was Ok to as high as $14,000.00 if the blades were bad. A friend with the same prop just spent $8,000 to get his propeller updated to do away with the AD (the AD is due every 5 years unless updated). HAWK CFII Sterling flew N3815B a lot in the past and said the airplane would not work to train the kids. The kids could not get complex airplane time because it had a throw over yoke and no brakes on the passenger side. Using it for instruction was out. The cost to get it flying was extreme. The fact the airplane only has a value of around $35,000 in real good shape made the cost of repair prohibitive. HAWK had two offers for the airplane and the members decided in a special meeting to accept one of the offers rather than take the risk of fixing it and marketing it with HAWK’s limited funds.. The Items that needed fixed were items that the kids could not do in house, so from an educational standpoint it was not a good investment. The airplane now has a good new home with someone repairing it to use it as their personal airplane. (HAWK was not going to let it be scrapped). And HAWK has a few more dollars in its account. Again thank you Mr and Mrs Lovelace. Ron Huddleston and his wife Gail with the Arion Lightening Ron built. HAWK member Ron Huddleston and his wife were so impressed with how the members of HAWK handled N3815B and that the HAWK group wanted to see it continue to fly rather than scrap the airplane they decided to donate their airplane to the program. 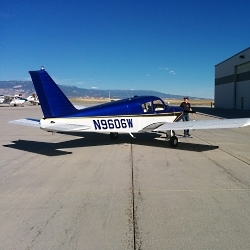 In February the Huddleston family donated the 2014 Arion Lightning that Ron built to HAWK. (Actually it is a Huddleston Lightening on the registration). The airplane needed a condition inspection and some minor work which the kids can help with. By HAWK doing the work to get it in the air. With Ron’s blessing the plan is for the airplane to be available for sale at Oshkosh 2018 with the funds going to educate the HAWK youth in aviation. Ron Flew P2V Neptunes off aircraft carriers and is a retired from United Airlines and is aware that most kids can not afford to fly due to today’s costs. He is a HAWK member and is doing his part to get kids into aviation. Ron donated the funds to do the Cherokee interior and really believes in kids being the future of general aviation. Thanks Ron and Gayle for your support. Jerry F is currently doing the condition inspection with any kids he can steal from other projects to help. HAWK’s Hot air Balloon in Tethered Flight. The balloon is flying regularly and several HAWK kids should have their private certificates by the end of 2018. The chosen kids can fly it at no expense to them. (totally free including fuel and instructor) The program is like an aviation scholarship for the chosen HAWK kids that will be old enough to get their Private Pilots certificates within a year or add it as a type rating. The kids can solo it at 14 and get their private at 16 years old. The kids chosen to fly the balloon must crew it, work in the HAWK shop regularly and must attend the free HAWK ground schools each month. Currently Jake M, Christa, Braden, are working on their Private pilots license. Michelle H is the mentor and Eddie C is maintenance and instructor. William M got HAWK’s second inflator fan running. William is also turning into HAWKS engine mechanic and is currently repairing a 20 hp John Deere lawn mower motor that HAWK will sell for operating funds. ( I will say going through the IACRA program to become a recommending instructor was enough to drive a grown man crazy.) Without Sterlings help I would have given up. With Sterling’s help and after 2.5 hrs of trying to get my address recognized I became a Recommending Instructor- what a pain! Seems the records show my home address as a business since I use it to repair balloons and IACRA will not take a business address. Thanks to Sterling my official address for IACRA is now 5 miles SW of Fruita- go figure)?. The HAWK 172 is being reskinned due to the hail damage to all the top surfaces. The wing is in the Cessna wing Jig and is being taken apart. Solomon B is removing the damaged firewall. 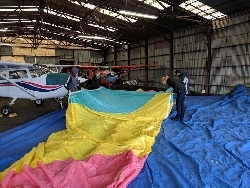 Christa and Collin have removed the tail and are currently reskinning the wing and control surfaces. Collin, Solomon and Logan are the crew working on it with Shay and Eddie as the mentors. This is a big project and will be years in the making but will make an exceptional 172. This program really shows the kids how to do aircraft type sheet metal work. And is very active. There are about 20 boxes in various stages of construction plus more than 10 finished. 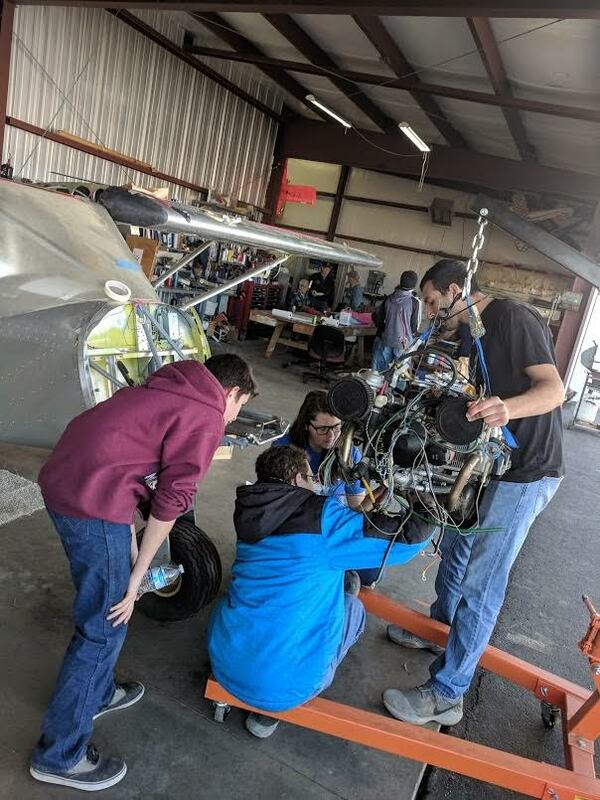 Tristan, Ryan, his brother , and Collin are doing a very good job on their boxes and should progress to aircraft work shortly. Collin is working on the 172 mentored by Christa. 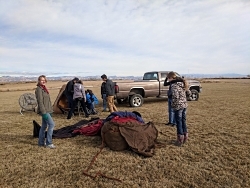 The Kids: Christa, Jadin, Lyle’s son Ryan, and mentor Shay doing a gore by gore inspection on Lyle’s hot air balloon. Shay’s 172 is the one with the cowl covered. Lyle Bingham HAWK’s web guru brought his balloon over from Utah to get it annualed and to attend the HAWK board and members meeting February 10th 2018. After the HAWK meetings his balloon was inspected by HAWK’s balloon inspector with the help of the HAWK kids and returned to service after a few minor repairs- most problems found by young eyes. While at Mack, Lyle made a nice donation to HAWK that was matched by the little company he works for called Dell (Yep that computer company). Seems they support what their employees donate to nonprofits with a special program of matching funds. HAWK is really fortunate to have someone of Lyle’s caliber donating their valuable time to make the HAWK program work. Braden works with Lyle and maintains the web site with Lyle. Braden is also getting his Solidworks certification and teaches kids Solidworks at his High School. 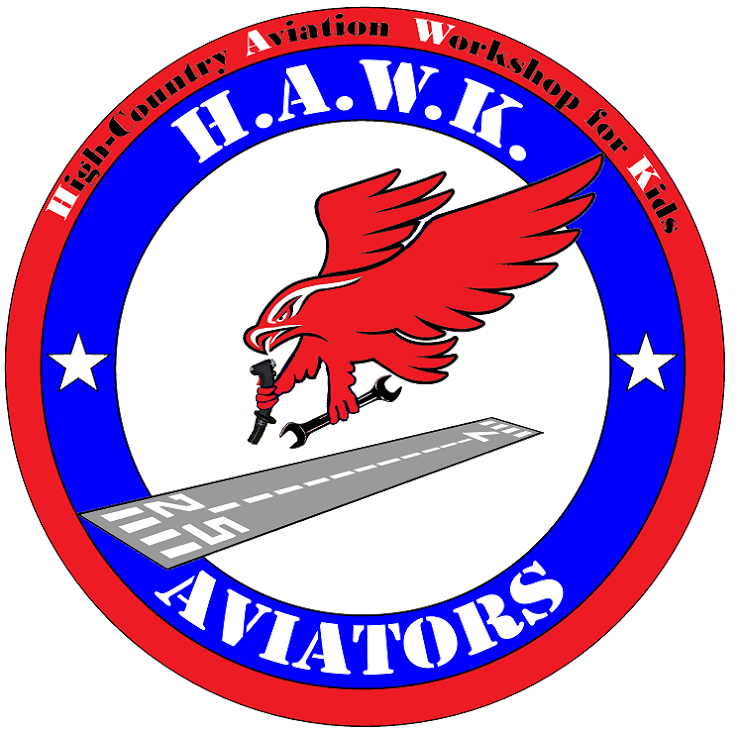 Watch for Beth Stanton’s article on the HAWK program in the MAY 2018 issue of Sport Aviation- it should be interesting. 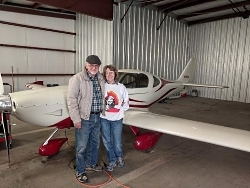 Ron Huddleston and his wife Gail with the Arion Lightning Ron built. The new year offers a new adventures for the HAWK and EAA 800 kids. HAWK continues to grow and the end of 2017 was definitely interesting. The November EAA meeting featured a talk by an IAC judge DJ Molny. His talk with video was about how scoring of the aerobatic flights in the aerobatic box is accomplished. It was really interesting and boy does it require a sharp eye. Anyone that missed it sure missed a good presentation. The December EAA meeting was the annual EAA lunch and was again, like last year, held at the El Tapatio Restaurant. It was a social gathering and an awards presentation. All the officer’s got pins and a certificate. Sterling got a second one for Information officer and Steve Linderman for Web officer. Ken and Jeri’s was for MVP. Ken and Jeri Hurt were given the award for most valuable EAA 800 2017 player because the Hurts coordinated the Young eagles flights and also ran several fund raising projects, plus they do lunch at every EAA meeting.. The Cherokee annual became due January 1st 2018. 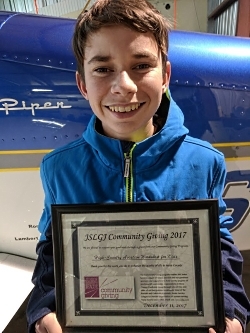 The annual was started over the Holidays in December and turned into a real rodeo, and prevented Braden from taking his Private checkride on his birthday in January. 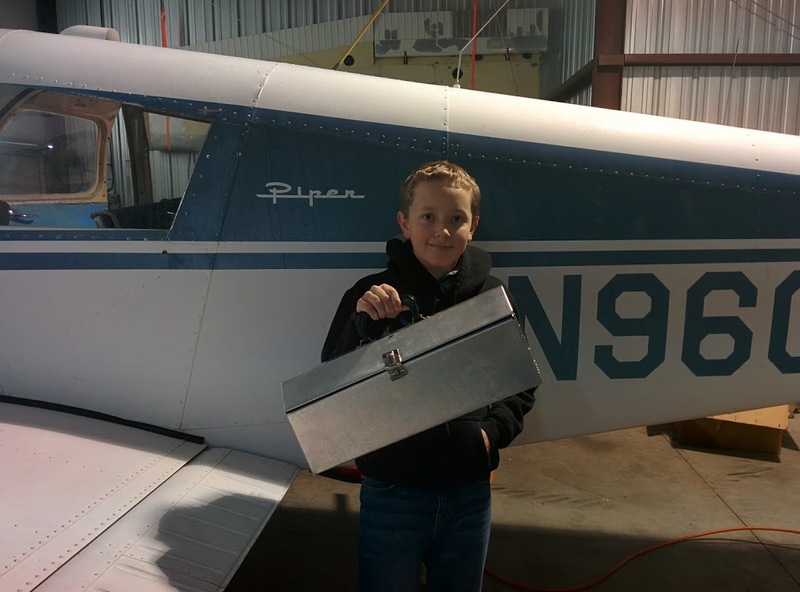 (He scored 92 on the written- not bad considering he is the first person to take the private pilot written after attending HAWK ground School). Several AD’s were due and required the airplane to be shut down for longer than planned. The AD on the Control Yoke inspection revealed a crack on the LH yoke. This seemed like a minor problem. Wrong! Seems this is a common Cherokee problem on the older plastic yokes. A used yoke was located but after getting it shipped in during the Holidays on inspection also was determined to be cracked. New replacement yokes do not exist. The Piper Factory tech rep was a good help and finally led to a good used yoke in an aircraft salvage yard. (The piper Tech was very professional and helped with several AD’s on our aircraft). Unfortunately the used yoke found is still a plastic yoke and the AD still Applies. It will get the airplane flying until a better yoke is found. 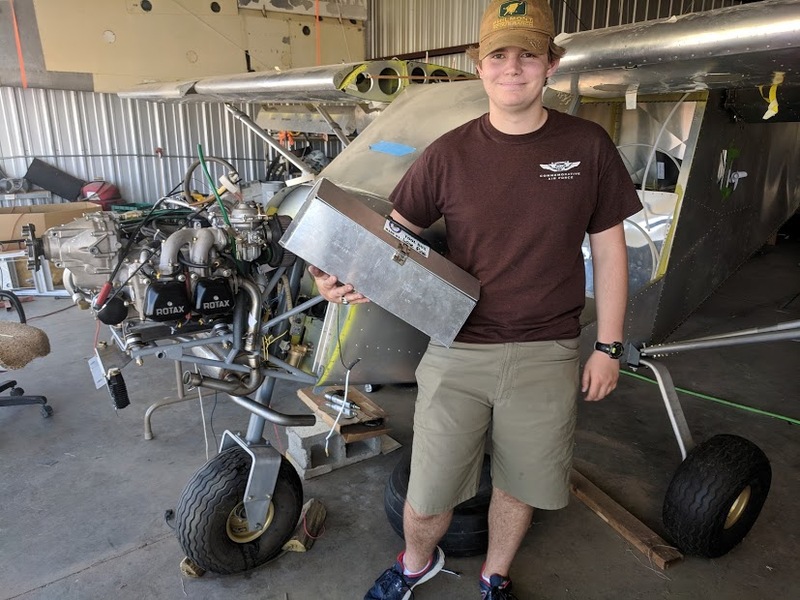 Braden is designing a new aluminum yoke in Solidworks and the FAA has agreed to work on getting it field approved as they are well aware of the problem. 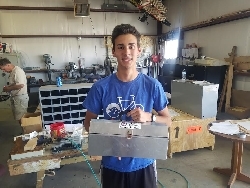 Braden was exposed to solid works in a class at HAWK run by Jeff Goodrich of RADCAD design. Braden then worked with Jeff after hours. Apparently Braden is the Solidworks tech at his High school and is set up to test shortly to become Solidworks certified. Braden has a miniature example of the yoke he designed printed on a 3D printer. The kids are learning. All this rodeo caused Braden to not be able to complete his private on his birthday. He was ready but the airplane was not. The other AD that was due is somewhat easier but required some disassembly of the aircraft. This AD affects the balance weight tube for the elevator and after talking to the Piper tech it was determined the HAWK Cherokee has the tube the AD applies to. The Piper Service Letter and the AD do not offer any indication as to what tube is in Cherokees. 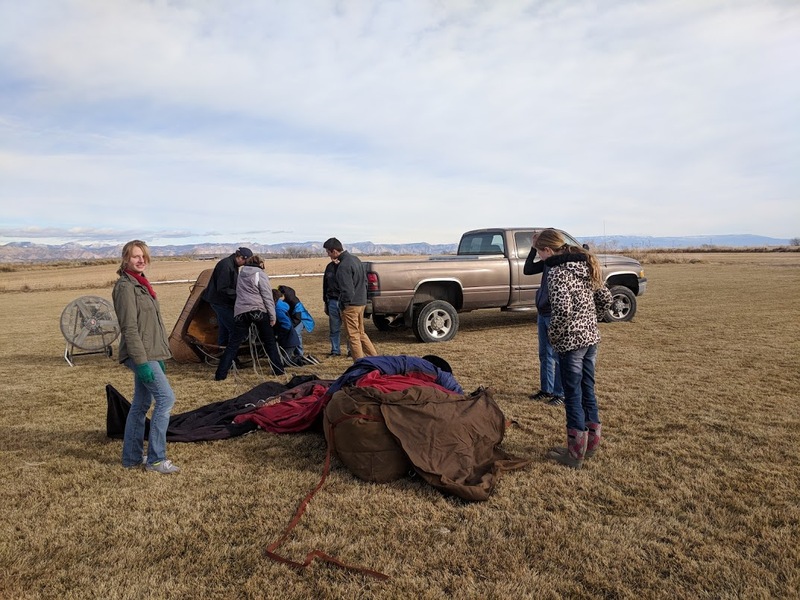 Kids rigging the HAWK Balloon for flight. Braden inflated it this time. He is working on a balloon rating with several other kids including Krista who is looking at the camera. Caden, Jake and William received instruction after each landing and kid change. After talking to the Piper tech it gets down to the color of the ears where the elevator cables attach.. The non AD tube has Green ears and also has a wall thickness of .120. HAWK’s tube is .090 thick and did not have green ears. This requires removal every 2 years for a magnaflux or dye check inspection of the bolt holes where the tube attaches to the Stabilizer. Ours passed crack inspection. Piper does make a new tube that does away with this AD- just requires money to acquire one. The Cherokee was detailed by the kids while all this was going on. The airplane will fly again in 2018 and Braden will finish his private pilot’s license. The HAWK Balloon is flying regularly and kids are building time. The balloon has flown over 10 hrs of kid instruction in December. And lots of kids are getting burner time. N90555 the HAWK balloon flies extremely well. It will fly over 3 hours on 30 gallons of propane. Not bad for an old recoated balloon. Hopefully by summer several kids will be private balloon pilots. 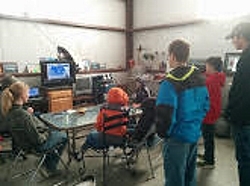 HAWK kids attending a typical Ground school- this one is on weather. They even attend when the Classroom has not warmed up. HAWK kids worked on drilling rivets out of the hail damaged control surfaces of the 172. And are doing an awesome job. The kids learned a lot building tool boxes. Now they are using what they learned on airplanes. As soon as funds are available new skins will be ordered.. The Zenith 701 is progressing nicely. Pat W. and his group of kids are doing an awesome job and hopefully it will fly this summer. The tail is back on and all the controls work. Even in the correct direction. The wings are nearly finished and are about ready to install. Tim Allen, our newest mentor, built an engine mount for the Rotex 912 per Zenith plans and it looks like factory. Lane and Cindy J donated the 4130 tubing to make the mount. THANKS Lane and Cindy. Tim owns Bulldog Machine and does very high end work on zip lines and other technical projects. He put the paper engine mount plans for the mount into Solidworks and then machined all the joints to fit perfectly. Tim’s dad, Bill Allen, built lots of airplanes including gyrocopters and founded a gyro Company in Utah called Hawk. Small world that they had the same name as ours but no connection. Bill was a true craftsman. Seems Bill passed his talent to his boys. HAWK is really excited about Tim joining us. Watch for more exciting things out of HAWK due to Tim – Tim has some unique ideas for HAWK kids and worked with kids on Darpa competitions in the past. HAWK is very lucky to have a person like Tim involved. The Donated Bonanza F35 is now officially HAWK’s and the paperwork is on the way to Oklahoma. The airplane is going to be moved into the build Hanger to start an Annual. Hopefully it will not require too much. We do know the prop has a major AD on it. Hopefully it will be good. It will have to be sent to a prop shop and probably will be the last item done as it is not cheap to do. We will see how the airplane checks out. At least the airplane was donated and anything made off it will help HAWK. HAWK’s plan is to sell it for operating capital. So if anyone wants a nice Bonanza get in line? HAWK has a tentative sale depending on the annual results. One of HAWK’s mentors Russell Franke is working to get gliders going in HAWK. 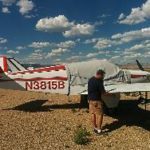 He has purchased 2 Schweizer 2-22’s and a flyable PA-25 Pawnee plus 2 Cal Air tow planes that need a little work. I have a schweizer 2-33 that needs some minor work and HAWK is working with several CFIG glider instructors and tow plane pilots to get them involved with HAWK. This summer should be interesting at Mack with powered airplanes, gliders, and balloons. We will be busy teaching kids. Time will tell! Jake smiling with the Jr Service League plaque. HAWK is really becoming known. The Grand Junction Jr Service League, a non profit that works with educational non profits, donated $1000.00 to the HAWK program to help finish the 701. This was Brian M’s project and I am sure this is only a start with them. They are really impressed with what HAWK is doing..
Watch for a full article about EAA 800 and HAWK in Sport Aviation in the next few months. Beth E. Stanton is working on an article and the article may be out before my next HAWK update. Beth stopped by the HAWK Cherokee at Oshkosh 2017 and talked with the kids. HAWK is very fortunate to have someone of Beth’s caliber doing an article about the HAWK program. HAWK and EAA 800 continue to make flight possible and affordable for kids. Go to hawkaviators.org to keep up with HAWK happenings. As always, thanks to everyone that makes HAWK viable. The list is getting long. It is sure fun watching the kids grow up in HAWK.